Pastellfarben haben es auch mir sehr angetan. Dieses gemusterte Vintage Kleid umfasst einige tolle Pastelltöne. Da es ja leider immernoch so kalt ist, musste ich noch einen Pullover drüber ziehen. Aber um das ganze nicht zu dunkel zu gestalten, habe ich sowohl einen hellen Pullover, als auch eine helle Strumpfhose gewählt. lovely look! i love the dress! I love the print on that dress, it's so cute!! So sweet! 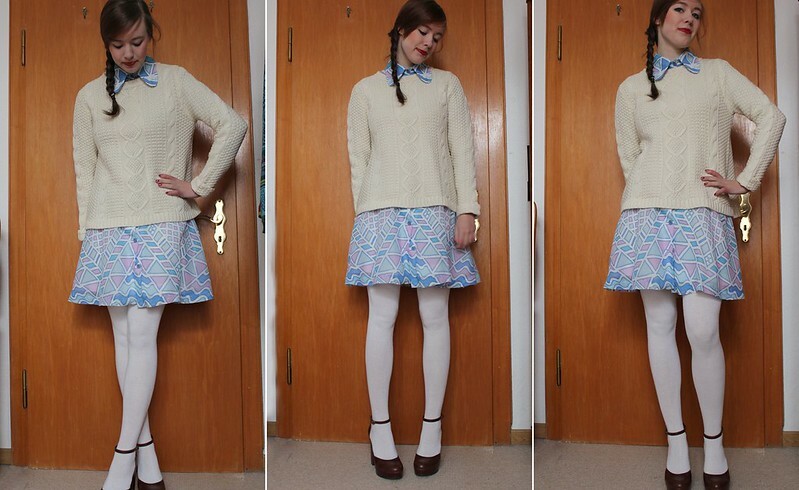 I love the print of the dress, and me that usuale has an aversion for white tights love them in this look of yours! I have a similar dress, but never dared to wear it with black tights ! Love the geometric print on your skirt and the way you styled it. You look adorable!!! Love your shoes! cute !! i love your style and color. mind to following each other? aww love your dress! you look simply chic and cute! und vintage kleider sind sowieso nicht zu toppen! Oh Gott *. * ich liebe dieses Outfit ..
Love your look darling! Also I adore retro and vintage style so I'm following you with a great pleasure! Would you like do the same for me? Super süß, toll kombiniert und total verpsielt!